This photo, taken Monday near Ankeny, shows the three vandalized beehives surrounded by logs and cinder blocks. Grateful Acres Farm owner Jake Knutson said thousands of his bees are dead after their hives were left exposed to the rain. 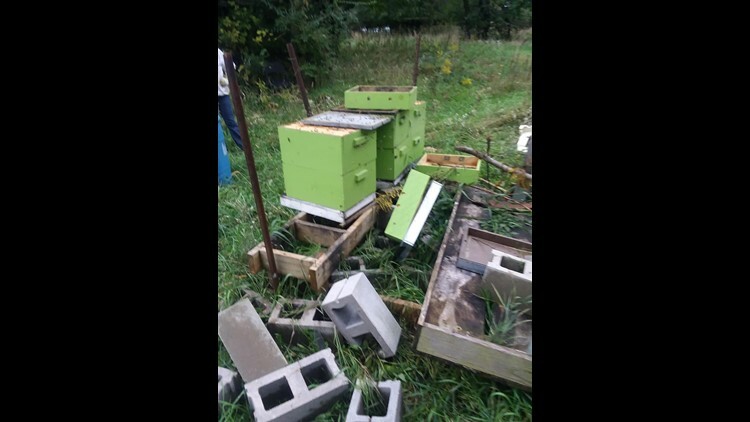 An Iowa farmer lost tens of thousands of bees and about 150 pounds of honey after vandals trashed his colonies with cinder blocks and bricks, leaving the insects to die in days of rain. It's the latest hive vandalism to make headlines over the past year after bee massacres from Ontario and California to Manchester, England, totaling hundreds of thousands of lost insects. Another Iowa vandalism last winter killed 500,000 honey bees alone, leaving the insects, which don't fly in cold temperatures, to die on the snowy ground. Two boys, 12 and 13, received felony charges over the $60,000 in damages, and the beekeeper facing loss after this month's vandalism believes kids to blame, too. Jake Knutson, who runs Grateful Acres Farm northeast of Des Moines, found three of his strongest hives damaged on Monday. Someone hit the wooden box hives with logs, bricks and cinder blocks, letting bees from nearby farms steal the 100-plus pounds of honey from the exposed containers. Rainfall blanketing Iowa killed most of the bees from each hive, which can hold up to 60,000 insects each. Not wanting to see children face criminal charges, Knutson didn't contact authorities. Then he found a hive newly toppled over on Wednesday, and filed a report with police. "They don't get a pass anymore," said Knutson, whose put the damages at $400 to $500. He plans to rebuild the hives for next year after saving as many bees as he still can. Rusty Burlew, a master beekeeper in western Washington, pondered the problem of hive vandals at her blog, Honey Bee Suite, writing that she finds the destructive act inextricably tied to teenage boys. "Vandalism is what happens when a pea-sized brain is soaked in a jug of testosterone," Burlew said in the post. She acknowledged, though, that some attacks — such as, perhaps, the spraying of gasoline on hundreds of thousands of bees that occurred in Prunedale, California, in January — point to adults, not teenage kids. Burlew recommended placing beehives in non-visible locations on private property, painting the boxes a muted color and minding not to "parade around in your bee suit." And while vandalisms killed hundreds of thousands of bees over the past year alone, the threat pales in comparison to the crises faced by bees, which play a massive role in our food supply. Bees pollinate one out of every three bites of American food and $15 billion worth of crops annually. Honey bees are dying off at an alarming rate because of parasites, pesticides, poor nutrition and disease, with about 40% of the nation's honey bee colonies dying in the past year. A popular weed killer found in Roundup may be to blame, a recent study found. Bumblebees — primary pollinators of tomatoes, blueberries and cranberries — made the endangered species list for the first time last year in the form of the rusty patched bumblebee. That came after the Trump administration relented to allow the bee on the list as directed previously under former President Barack Obama.